It was last January when we distributed 35 used iPad1s to 35 eighth grade students in Mr Boggs’s class at Pajaro Middle School in the Pajaro Valley Unified School District. Students were excited and enthusiastic to receive the iPads; teachers and parents were nervous. Nine months later we have some experiences to share. After four months of students taking the iPads home on a 24/7 basis, we had one iPad that developed an issue with the connector and one that had a broken screen. All other iPads were returned in excellent condition and used again this fall for a new set of students. Each iPad was equipped with a copy of the HMH FUSE Algebra textbook which provided access to an abundance of online resources, videos and supplemental information. The textbook came alive for the students and was used frequently throughout the year. Each iPad also had a variety of other apps that were downloaded by the teacher prior to distribution or that the students downloaded with guidance from the teacher. The teacher accepted the large challenge of integrating this new technology and textbook into his curriculum. He began to flip his classroom, and the students adapted quickly. He investigated and implemented new apps to use with his students. He found that he had more time to work individually with students during class and that the students were enjoying the class time more than before. This fall, Mr. Boggs’s algebra class was a commonly requested class by students. The forward-thinking principal, Jean Gottlob, reported that Mr Boggs’s Algebra class was one of the most frequently requested classes of the year. (Did you catch that? Algebra was one of the most commonly requested classes! If engagement is a key factor to student learning, Mr. Boggs had the key to learning whenever he was using the iPads in his instruction. The students were enthusiastically participating in a variety of ways. It is with tools like these that creative and daring educators like Mr. Boggs and forward thinking leaders like Principal Gottlob can double the learning, triple the enjoyment, and maintain an outstanding instructional institution. I contend this advice is applicable today as it relates to selecting and using apps for mobile devices such as tablet computers and smartphones. If you do a search of “apps for teachers” or “special education apps” you get thousands of hits. Many of those links connect to someone’s personal list of “recommended apps.” That’s okay, but I think it is too easy, and subsequently ineffective. A foundational element of learning is that every learner is unique. If that is true then it is the responsibility of effective educators to get to know their learners and find just the right resources to help them. Here is where the power of 100,000 apps comes in. With that many choices out there, surely some exist that are just the right resources to help each learner. However, if we simply place our trust in someone else’s recommendations, someone who doesn’t know our specific students, then we’re just shooting in the dark. What to do? Rather than offering a Top 10 or Top 100 list, I think it is more powerful to help educators become skilled at determining the effectiveness and quality of apps for themselves. Teachers should explore just how individual apps fit individual student needs—or not. There are some good rubrics in the public domain that can serve as a place to start talking about quality. Going through the process of evaluating apps together (or any other type of resource, for that matter) helps a group of educators have fidelity to the common core values of the school and helps everyone be a better educator. Having a discussion about an app always involves considering how the app could be used. Hearing what someone else would do or does with an app will help expand everyone’s thinking. When this happens, not only are educators learning to fish, they are fishing together. Educators all over the country are exploring ways they can use iPads and other tablet technologies as tools for teaching and learning. Apps—free and low cost programs designed to be used on these devices—are a primary attraction. What better way to provide quick and easy access to instructional activities than by downloading and using some of the thousands of education apps? But I’m noticing a troubling trend. Many of the apps labeled “educational” are developed by programmers with little or no background in education; use of these apps does not support student learning in any fashion. In addition, there are teachers who are spending a lot of time and energy figuring out ways to use apps that make no claim to be educational and do not support the curriculum in any obvious way, but that are fun to play. It reminds me of the days when desktop computers were initially introduced to classrooms. The year was 1985. Good educational software was still difficult to come by. Once a teacher had run through the offerings from the Minnesota Educational Computing Consortium, (think Oregon Trail and Lemonade Stand), there wasn’t much else available. 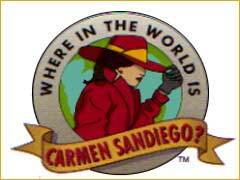 Then Brøderbund Software released Where in the World is Carmen Sandiego? The goal of this fast-paced game was for players to travel the world solving geography-based clues, track multiple villains, and finally arrest Carmen Sandiego herself. The software was a hit, becoming a staple in many computer labs, despite its limited applicability to the curriculum for a narrow range of grade levels. This is what I call Carmen Sandiego Syndrome, the willingness to use a software program for instruction even when there is little or no educational value. For school leaders this becomes a problem because first use of a new technology often becomes entrenched use. It is critical that we help teachers avoid this pitfall. One strategy for avoiding Carmen Sandiego Syndrome is to insist that teachers take time to carefully review new apps using tools that measure how well the objectives of an app align with the curriculum. There are three free tools I recommend that can be used for this purpose. The first is a rubric called Evaluation Rubric for iPod/iPad Apps created by Harry Walker (Johns Hopkins University) and modified by Kathy Schrock. The second is the Critical Evaluation of an iPad/iPod App checklist developed by Kathy Schrock. And finally, eSkills Learning’s Mobile App Selection Rubric. These resources and more are available in the iPod Touch & iPad Resources LiveBinder which Chris O’Neal and I developed and maintain. This is not a time when more is necessarily better. Take the time now to insure that teachers are making well-grounded decisions about the apps they introduce into the classroom. Students will reap the benefits for the long term.